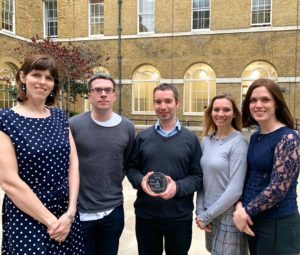 We are delighted to announce our team was awarded the 2018 UCL Rosetrees Stoneygate Prize for research into improving nerve grafting using biomaterials. This cross-faculty research team led by James Phillips includes Rebecca Shipley, (UCL Mechanical Engineering, UCL Institute of Healthcare Engineering), Ashleigh Boyd (UCL Division of Surgery & Interventional Science, UCL Institute of Immunity & Transplantation), Victoria Roberton (UCL School of Pharmacy) and Gareth Williams (UCL School of Pharmacy). The project will run for 3 years from April 2019 and will use a multi-disciplinary approach to develop alternatives to nerve autografts.